In Jan-12 we spoke with a major TV component supplier who has been contacted by Apple regarding various capabilities of their television display components. We see this as continued evidence that Apple is exploring production of a television. This latest data point follows Jan-11 meetings in Asia that led us to believe Apple was investing in manufacturing facilities for LCD displays ranging from 3.5″ mobile displays to 50″ television displays. In Sept-11 we met with a contact close to an Asian supplier who indicated that prototypes of an Apple Television are in the works. We believe TV hardware could be ready for a late CY12 launch, but the timeline and scope of a revamped content solution is more uncertain. What remains unknown is whether Apple will be able to make any revolutionary changes on the content side within that timeframe. 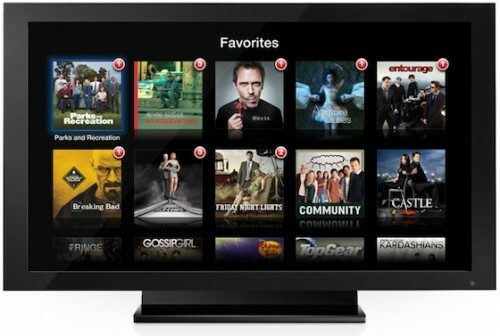 The company has made several efforts to work with content providers on ideas such as "best of TV" packages that would be made available through iTunes and enable users to in some cases eliminate their cable television subscriptions, but the company has reportedly made little progress in those negotiations. IMO, the concept of a television product launched by Apple must overcome the massive obstacle described in the above quote. And even that comes with tremendous issues. For example, who owns the broadband pipes that would flow the cableTV killer from Apple to this TV (where I am that's Comcast or AT&T- both of which like their cable subscription revenues "as is")? Why are they going to allow Apple to steal their revenue stream through pipes they own? The missing rumor is something that would allow an Apple solution to bypass the broadband gatekeepers who are also in the business of selling cableTV subscriptions. That rumor is desperately needed for this rumor to gain much credibility (to me anyway). There are tremendous revenues in commercials. There are tremendous revenues in cable/satt bills "as is". Some of those revenues feed the content creation infrastructure. The dream of no commercials removes about $49 Billion from that feed in the U.S. alone. Yes, there's profit in there but there's also money that pays for actually creating the stuff we want to see. When we dream of an Apple cable killer, we generally dream of it being ONLY what we want to see (aka "just the channels I want to watch" al-a-carte) often commercial free. The kicker is that that dream is usually accompanied with a cheap price on an assumption that if 200 channels cost $100/month (or 50 cents each) the 10-20 to which "I really want to subscribe" should cost about $5-$10/month. A model change from $100/month + commercial revenues to $5-$10/month with no commercials will kill the volume & quality of content production. Even the rumored $29/month subscription for "just what I want" makes no sense. Take the revenue made ONLY from the commercials- $49 billion- and divide it by the number of households in the U.S. (about 300 million people at about 4 people per household = 75 million households). $49 billion divided by 75 million = $654 per year (per household in just industry-supporting revenue made from commercials). If the replacement model is commercial free and if we want to maintain the same industry infrastructure that depends on that revenue, we consumers must make up that cost. $654/12 months = $54.5 per household. See why the rumored $29/month concept doesn't fly? Set that aside. If we assume the "greedy cable monopolies" are taking about 50% of our $100/month bill as profit (which is not true), then the hard cost of the content must be about $50/month per household. See why the rumored $29/month concept doesn't fly? Now blend them in the dream concept: no commercials, bypass the greedy cable company, and we have to reconcile about $154/month in the current model down to just $29/month in an imagined Apple replacement model. Won't Apple want their 30% too? This whole rumor is just a mess when someone logically thinks it through. And I still haven't seen a single rumor that offers anything positive about what I quoted above (forget all the math I just offered). I love :apple:TV and long for an updated one (and anticipate that THAT is much more likely than a whole television). I just don't see an Apple Television flying. The above is just a few of the obstacles. Don't forget the live sports issue. How about local channels? Can Apple make a screen size that is a mainstream desired size for many? Can Apple choose a panel technology that is mainstream desirable for many? What about the port options? Locked only to iTunes? There's just so many issues. Biggest for me is the content sourcing referenced above. A close second is the concept that a $100 or so set-top box could bring just about anything that might be done in software to ANY HDTV from anyone else. When Apple software can be run on any competitor's hardware, Apple hardware must then compete toe-to-toe on its own merits. I just don't see it.